We knew right away that it’s time for a little series about jeans history. Here we will sort out all concepts. We start a little easy with a story of a nit. 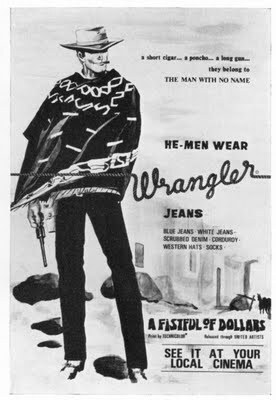 It began with jeans was Levi Strauss. He took out a pair of pants for use in the gold mines in the United States. For that they would keep so well that it was only possible under the tough circumstances, not contented with just the cobbling together parts to my pants. They even set up tygstyckena with rivets at strategic spots. As you know, these still exist, despite the fact that it no longer posed quite the same requirements for strength. But some of the rivets are Levi’s picked away over the years. 1937 begins to cover over the rivets in the back pockets after complaints that they scratched seats and saddles. The rivets later disappeared entirely. But a more enjoyable story is about another nit. It was the one that held together the jeans in the crotch. The reason that they disappeared is that it started to get complaints from the cowboys around the country. They claimed they had received burns of the rivet when the victim squat a little bit too close to the campfire. The rivet quick was hot and led into the heat directly at a very sensitive area. The Manager at Levi’s, Walter a. Haas, was unconvinced about the issue but decided to try it for yourself. Wearing a pair of 501, he crouched in front of the fire for a short time. On his orders, then disappeared, the rivet in the pubic area forever 1941. 1999 Levi’s did a commercial of the story. To illustrate the problem, they got permission to use Johnny Cash’s classic song, Ring of Fire. The same song is scheduled now to be used in another commercial, but this time for a hemorrojds alva. It was the family Cash not nearly as interested.